Autumn is here. The nights are cooler, the days shorter, the summer garden is starting to wither, and autumn fruits and vegetables are filling produce stands. I’ve gone from craving tomatoes, berries, and zucchini to craving grapes, apples, pears, and butternut squash. I have a thing for pears. I adore them and can’t imagine autumn and winter without them. That slightly soft crunch and juice running down my chin…that’s what a pear is to me. My boys have followed my pear passion, each asking for a pear to take for lunch every day, and they are disappointed when the pear basket runs empty. I usually buy Anjou or Bartlett pears for eating out of hand, so the boys were very surprised by the Bosc pears I brought home last week. They asked about the color and wanted to eat them, but these pears were for a special baked dessert. Firm, very fresh pears work best for roasting, but if your pears are a little more tender, just reduce the second roasting time to 20 minutes or less. To core the pears, I cut it vertically down the middle then use a melon baller to scoop out the seeds. 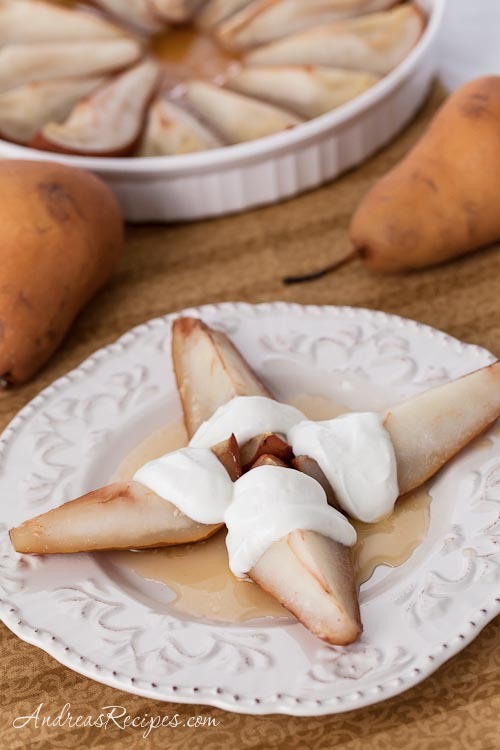 Pear sizes vary, so you may need a larger pan or use fewer pears. I found that the 9×13 dish wasn’t quite large enough and only used six of my large pears. The original recipe from Cooking Light (2001) calls for draining plain yogurt for 24 hours, then mixing in the honey and vanilla. Now that Greek yogurt is widely available, we can skip the long draining step. And if you are really in a pinch, a carton of vanilla Greek yogurt will work just fine. 2. Combine the apple cider, honey, lemon juice, and vanilla in the saucepan and bring to a boil. 3. Distribute the butter pieces around the dish and arrange the pears in the dish. Pour the cider mixture over the pears. Cover the dish and bake in the preheated oven for 20 minutes, then remove the foil and bake until the pears are nice and tender, basting occasionally, about 30 minutes. Remove from the oven and let stand for 10 minutes. 4. In the medium bowl, stir together the Greek yogurt, honey, and vanilla extract. Serve over the warm pears. I love roasting pears! It’s such a quick way to whip up a delicious dessert in no time at all. I love that you’ve added Greek Yogurt – YUM! !